Please believe me, it is important to get this classic Vodka Martini Recipe "right." Look at the picture! I LOVE green olives with a vodka martini! I was in the restaurant business for well over three decades and have entertained frequently at home. I am certain about this: A basic Vodka Martini must be perfect for martini drinkers and it must be served in the proper glass. Martini drinkers are very picky about this vodka restaurant drink recipe. The so-called "martini culture" is alive and well, and growing, in the U.S. 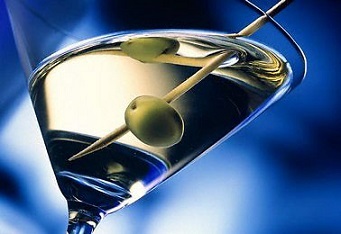 The people who want to enjoy a classic vodka martini know precisely how the drink should taste ...and look. It must be perfect or they will be unhappy. Don't worry. I have the perfect, the best, approved restaurant recipe for you. Follow the vodka recipe to the letter and serve it in the proper martini glass and your guests will applaud your efforts. 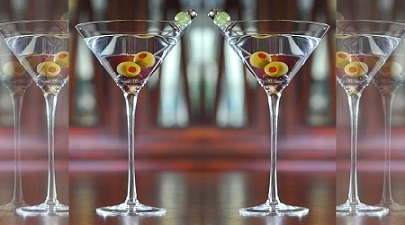 Enjoy your Classic Martini Recipe and the company of those you share it with! It is a famous restaurant drink recipe.